IRA (Irish Referral Agency / Irish Referral In-Home Senior Help) is an In-Home care referral service that connects qualified caregivers with seniors in the San Francisco Bay Area. Perhaps you are new to the concept of In-Home Senior Care. Perhaps you or your loved one has been receiving care through an Agency, and you're ready to make a change. How do you know when it is time to hire help, and what kind of care is the right fit for your needs? Seniors who are in need of care commonly have difficulty with everyday tasks like getting dressed, personal care, getting the mail, cooking meals. When it becomes difficult to perform even the most basic tasks of daily living, in-home senior help is recommended. Other indications that it might be time for in-home senior care are if recovery from a common cold or simple cut is not so simple, or there are one-too-many falls and other close calls. Getting in-home help can alleviate the stress, loneliness and despair that seniors living at home can face. It takes courage to open your home to a care provider who has easy access to your own or your loved ones finances, property, and legal documents. How do you know if this person is trustworthy, let alone the right fit? What qualities should an in-home caregiver demonstrate? Will he or she be able to provide quality care and balance it with compassion, patience, and even a sense of humor? Where do you even begin your search? At IRA we thoroughly vet every person on our referral list to ensure they meet industry standard qualifications. But we do more than that. 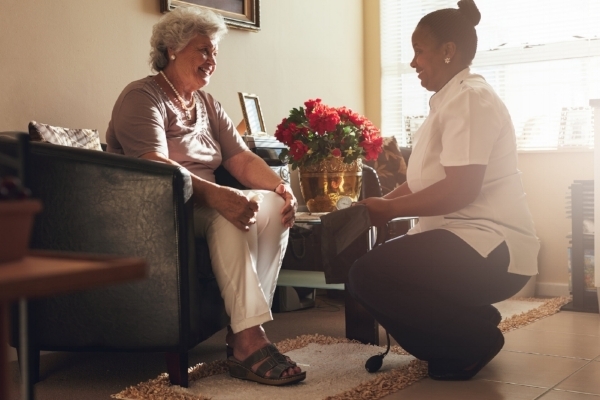 We also ask the hard questions to help determine that our referrals share the core characteristics we’ve found – over decades of experience in the In-Home Help industry – common among the best caregivers: initiative, enthusiasm, integrity, great communication skills, and being an elder advocate when necessary. Why did they choose to go into this profession? Do they love what they do? Do they pay attention to the little touches, combining excellent care with thoughtful details? What will the reaction be if your elder decides to be a bit stubborn on any given day? What ways can they bring fun, engagement and honor to the daily care they provide? What is their action plan should your loved one fall, or become uncharacteristically confused, or show signs of needing urgent care? Are they able to look at the broader picture, especially when things just don’t add up, to find out what’s really going on? Will they engage with the family as thoroughly, and in whatever manner, as they are instructed? The people who make it onto our referral list are dedicated professionals who have a passion for what they do and will treat your loved ones with the honor they deserve. We don't let anyone onto our referral list unless we ourselves would employ them in our homes. Remember, you are your caregiver's employer, and as such, you're required to set up a tax withholding system so that you and your employee are paying all legally required taxes. Though you might be tempted to pay a caregiver under the table - if the IRS discovers the relationship, you will be responsible for back taxes and penalties. IRA is proud to partner with Legally Nanny: Legally Nanny provides the legal and tax advice you need to hire and pay a caregiver legally. We fill out all the initial forms, draft a personalized employment agreement, and advise you on the legal and tax issues so you can save on your taxes and spend more time with your family. If you're ready to learn more about contracting directly with a caregiver who have been thoroughly screened and approved by our team, contact us today to get started. You will pay a percentage of the caregiver's earnings. Irish Referral Agency is a referral agency - connecting qualified caregivers with seniors needing in-home help in the San Francisco Bay Area.